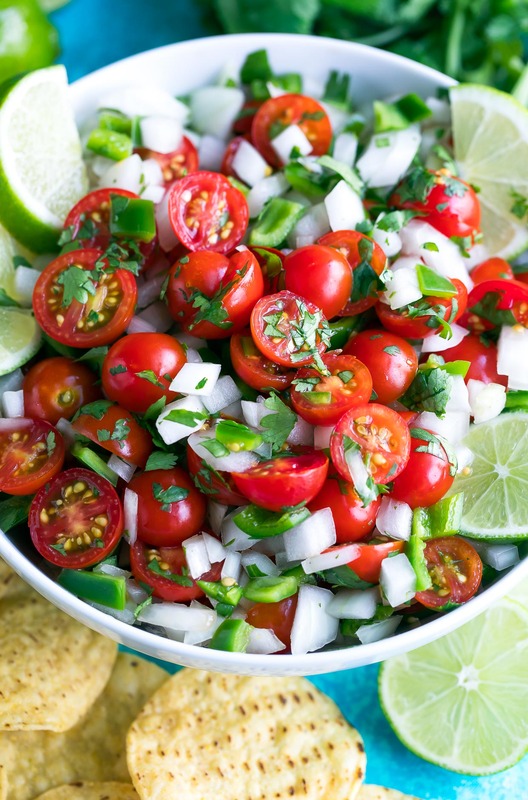 Cherry Tomato Pico de Gallo is bursting with fiesta flavor and ready in 10 minutes! Raid your garden, hit up your local Farmer’s Market, or simply stop by your nearest grocery store to snag some ultra-ripe tomatoes because this super simple salsa takes only minutes to make and is SO delicious! The kitchen is my calm. Whenever I’m feeling anxious or frustrated, all I need to do is beeline to the kitchen and play a homestyle version of Chopped with whatever assorted “mystery ingredients” I have on hand. It gives me a temporary sense of purpose and clarity. After a few minutes of mixing and chopping away, my mood is totally transformed! So whenever I’m feeling anxious, into the kitchen I go! This recipe came together so effortlessly and melted away my previously frazzled state of worry. 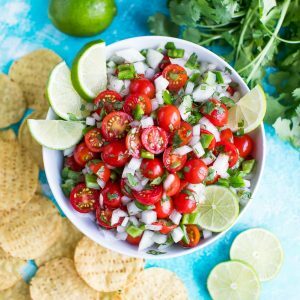 I used my garden’s endless supply of cherry tomatoes to put a fun spin on Pico de Gallo that totally rocked my socks! I used this pretty pico to make a tasty Tex-Mex avocado toast for breakfast and whipped up a plate easy cheese Pico de Gallo topped quesadillas for lunch! I may even use the leftovers for dinner too at this rate. LOOOOOOVE me some pico! 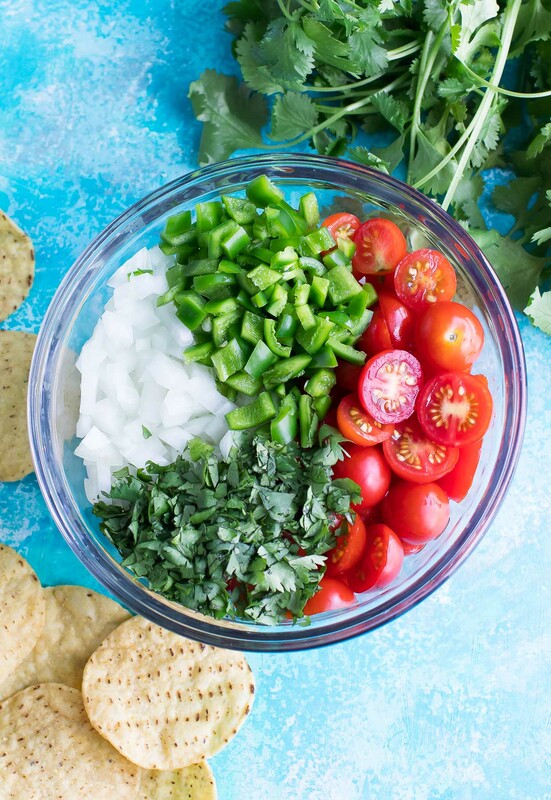 what’s in Pico de Gallo? Though I used cherry tomatoes here, you can absolutely use your favorite variety of tomato! Roma tomatoes are my usual go-to to make pico. The main difference between these two tasty toppings is that salsa is typically mashed or pureed while pico is simply chopped. 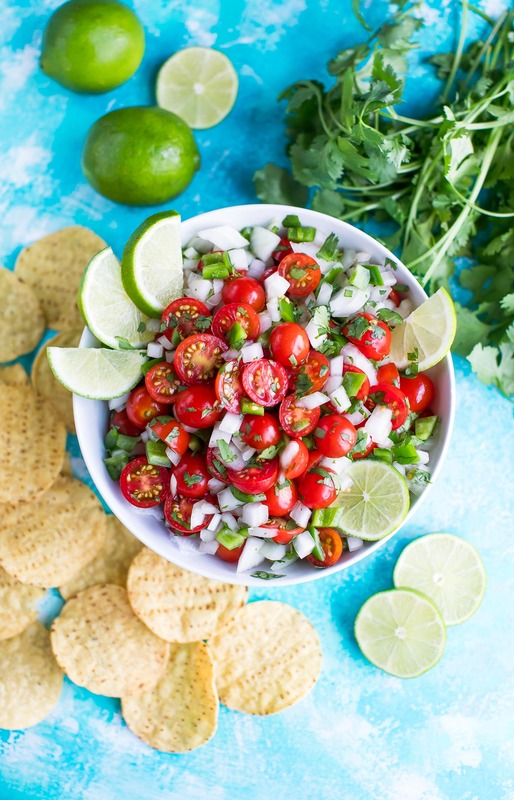 Pico de Gallo is always served up fresh and raw and makes a glorious topping for a number of dishes. 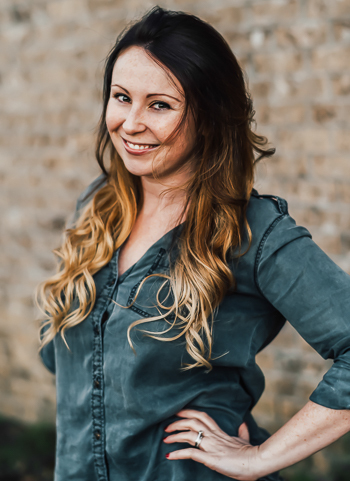 We love it on tacos, burritos, quesadillas, avocado toast, huevos rancheros, taco salads, and rice bowls. Make a little… or a LOT! This recipe is flexible enough to make a small snack-sized serving or a big bowl-o-pico for a party! 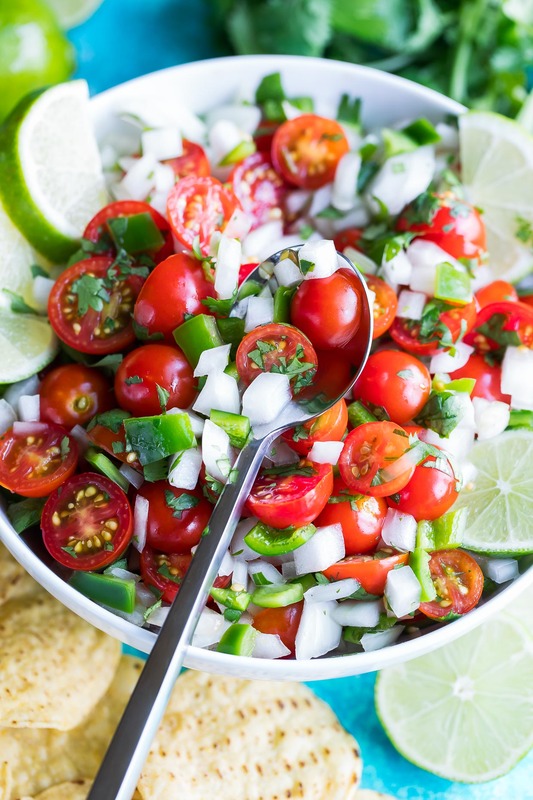 This Cherry Tomato Pico de Gallo is bursting with fiesta flavor and ready in 10 minutes! Raid your garden, hit up your local Farmer's Market, or simply stop by your nearest grocery store to snag some ultra-ripe tomatoes because this super simple salsa takes only minutes to make and is SO delicious! Chop your tomatoes and dice your onion. Remove the stem from your jalapeños and scoop out the insides with a spoon. Seeds may be added back in at the end to add an extra kick if you'd like a spicy pico! Cut peppers into strips and finely dice. Combine your veggies in a medium bowl with cilantro, lime juice, garlic powder, salt, and pepper. Mix well and give it a taste. Feel free to add extra lime, cilantro, onion, and/or spices to taste! Let your tastebuds be your guide for the perfect pico! Roma, plum, heirloom, vine-ripened, campari, and any other tomato variety can be used here! I adore making it with our garden's Roma tomatoes - woot! If you get a chance to try this easy peasy Cherry Tomato Pico de Gallo, let me know! Leave some love in the comment form below or tag your photos with @peasandcrayons on Instagram so I can happy dance over your creation! Mexican Breakfast Salad <— featuring this cherry tomato pico – woot woot! Cherry Tomato Salad – for all your extra tomatoes – Yum! I love all things tomato and all things Mexican! This easy festive dish was packed with refreshing summer flavors! I love picco and tried this recipe and it was fantastic! Such great flavor!